On 31st March in Canberra it was the Rise Above Cancer Convoy. Rise Above – Capital Region Cancer Relief, provides financial assistance and support to cancer patients and family residing with them within the ACT, Queanbeyan and surrounds. 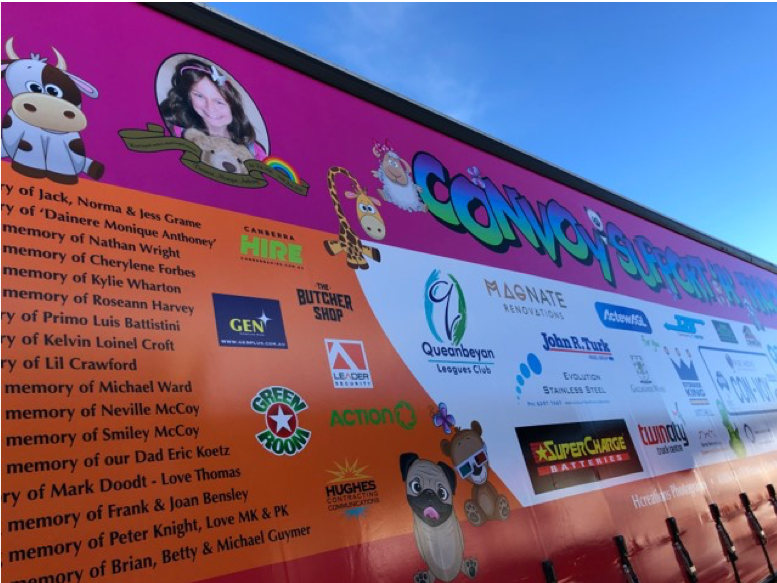 The convoy is their major fundraising event and one that has been embraced and enormously supported in the Canberra Community. This is so important as there is an ever-increasing need for assistance. This year, the year that our beloved Dainere should have celebrated her 21st Birthday, she was honoured in what is such an indescribably special way…she (and Theodore) were on the Support-A-Truck. It took our breaths away and there were some tears, but it was just incredible to see Dainere’s memorial on the truck: an image of her most radiant and beautiful smiling face, a butterfly and splendiferous rainbow and the words ‘loved beyond words & missed beyond measure’. Words just simple can not express how much this means to our family and Dainere’s legacy and we are just so, so extremely and eternally grateful to Melissa from Rise Above and the Team from Screenmakers who created the Support-A-Truck artwork.